Cardinal Giacomo Biffi commits his memoirs to a book. And here's a preview: the speech he gave in the closed-door meeting with the cardinals. And also, his critical views on John XXIII, on the Council, and on the "mea culpas" of John Paul II. 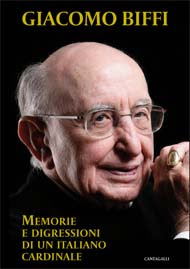 On the eve of his eightieth birthday, cardinal Giacomo Biffi is sending out to the bookstores an extensive autobiographical volume, entitled "Memorie e digressioni di un italiano cardinale [Memories and Digressions of an Italian Cardinal]." Biffi is remembered above all as the archbishop of Bologna, from 1984 to 2003. But in the book, he reviews his entire life, from his birth in working-class Milan to when he became a priest, then a professor of theology, a pastor, a bishop, and finally a cardinal. In the foreword, Biffi quotes these words of saint Ambrose, the great fourth-century bishop of Milan, his beloved "father and teacher": "A bishop can do nothing more perilous before God, and nothing more shameful before men, than fail to proclaim freely his own thoughts." And sure enough, in the 640 pages of the volume, Biffi's thoughts erupt in complete freedom – pungent, ironic, and anti-conformist. There is no crucial passage in the Church's life that does not fall beneath his biting, often surprising, judgment. It is surprising, for example, that he designates as "the greatest pope of the twentieth century" Pius XI, who today is perhaps the most overlooked and forgotten pope. It is a surprise to discover that, when he was archbishop of Bologna, Biffi – who was so greatly criticized for having said it would be better for Italy to welcome Christian immigrants over Muslim immigrants – he sheltered in a church for many nights, during the harshest weeks of winter, a large group of people from the Maghreb who were without homes. Even his silences are eloquent. The book dedicates just a few rare references to Joseph Ratzinger. But there are many hints to let the reader know that Biffi has extremely high regard for the current pope. It is an esteem reciprocated in the invitation extended to him by Benedict XVI to preach, in the Vatican, the Lenten retreat of 2007. On the other hand, his nearly complete silence on cardinal Carlo Maria Martini – under whom Biffi served for four years as auxiliary bishop in Milan – conveys a relentlessly critical judgment. Immediately before dispatching, in a few lines, the appointment of the famous Jesuit as archbishop of Milan at the end of 1979, Biffi makes it clear that the dazzling era of the great twentieth-century bishops of Milan – the genuine heirs of saint Ambrose and saint Charles Borromeo – came to an end with Martini's predecessor, Giovanni Colombo. And from another silence – the one in the book surrounding Martini's successor, cardinal Dionigi Tettamanzi – one gathers that, even with the current bishop of Milan, the season of the great "Ambrosian" and "Borromean" pastors still shows no signs of resuming. The reason is explained clearly. For Biffi, a bishop is great when he governs the Church "with the warmth and the certainty of the faith, the concreteness of projects and initiatives, the capacity to respond to the issues of the time, not with surrender and accommodation, but by drawing upon the unalienable patrimony of the faith." Evidently, in Biffi's view, neither Martini nor Tettamanzi fits this profile. Another personality that Biffi subjects to severe criticism is Fr. Giuseppe Dossetti, who in his youth was an important political figure – admired in those years by Biffi himself – then later a priest and monk, a very active adviser for cardinal Giacomo Lercaro at Vatican Council II, and the founding father of the "Bologna school" and of the interpretation of the Council as a rupture with the past and a new beginning. Biffi writes that Dossetti maintained until the very end "a primary and permanent obsession for politics, which altered his general perspective." In addition, he was compromised by an "insufficient theological foundation." Dossetti was the man who, in the past half century, had the greatest influence on the perspectives of Italian Church's intellectual elite. But the Italian spiritual leader who, in Biffi's judgment, saw with the greatest clarity the mission of the Church in the modern world and the threats that it faces, was Fr. Divo Barsotti, who is repeatedly recalled with admiration in the book. Cardinal Biffi's memoirs are obligatory reading for those who want to survey the current conditions of the Church from a viewpoint that is outside of the standard interpretations, and at the same time authoritative. But it also makes for a captivating read, gripping the reader from the first pages with the brilliance of its writing, which is always restrained and unembellished. It is the account of a life entirely dedicated to the Church. A few selections from this are presented below: on John XXIII, on Vatican Council II and its repercussions, on the "mea culpas" of John Paul II, and, finally, on the last conclave, with the complete speech – secret until now – addressed by Cardinal Biffi to the future pope. At the time, this pope – Benedict XVI – had yet to be elected. And yet he already corresponded so closely to the expectations of his great elector. Pope Roncalli died on the solemnity of Pentecost, June 3, 1963. I, too, mourned for him, because I had an unshakeable admiration for him. I was fascinated by his "unorthodox" actions, and rejoiced in his frequently surprising words and his spontaneous interjections. There were just a few statements of his that I found puzzling. And these were precisely the ones that won over hearts and minds more than any others, because they seemed consistent with people's instinctive aspirations. There was, for example, his judgment of reproof on the "prophets of doom." The expression became, and remained, extremely popular, and naturally so: the people do not like party poopers; they prefer those who promise good times over those who advance fears and reservations. And I, too, admired the courage and drive, during the last years of his life, of this "young" successor of Peter. But I recall that a sense of perplexity seized me almost immediately. In the history of Revelation, the true prophets were the ones who usually announced chastisements and calamities, as in Isaiah (chapter 24), Jeremiah (chapter 4), and Ezekiel (chapters 4-11). Jesus himself, in chapter 24 of the Gospel of Matthew, would have to be counted among the "prophets of doom": his proclamation of future triumphs and impending joys do not usually relate to existence here on earth, but rather to "eternal life" and the "Kingdom of Heaven." But the people in the Bible who usually proclaim the imminence of tranquil and serene times are, instead, the false prophets (see chapter 13 of the Book of Ezekiel). The statement from John XXIII is explained by his state of mind at the time, but it should not be made absolute. On the contrary, it would be well to listen also to those who have some reason to alert their brothers, preparing them for possible trials, and those who believe it is opportune to issue calls for prudence and vigilance. "We must look more at what unites us than at what divides." This statement, too - which today is often repeated and greatly appreciated, almost as the golden rule of "dialogue" - comes to us from the era of John XXIII, and communicates to us its atmosphere. This is a practical principle of evident good sense, which should be kept in mind in situations of simple coexistence and for decisions on minor everyday matters. But it becomes absurd and disastrous in its consequences if it is applied in the great issues of life, and especially in religious matters. It is fitting, for example, that this aphorism should be used to preserve cordial relations in a shared dwelling, or rapid efficiency in a government office. But woe to us if we let this inspire us in our evangelical testimony before the world, in our ecumenical efforts, in discussions with non-believers. In virtue of this principle, Christ could become the first and most illustrious victim of dialogue with the non-Christian religions. The Lord Jesus said of himself, in one of his remarks that we are inclined to censure: "I have come to bring division" (Luke 12:51). In the questions that count, the rule can be none other than this: we must look above all at what is decisive, essential, true, whether it divides us or not. "Distinction must be made between error and the person in error." This is another maxim that belongs to the moral legacy of John XXIII, and this, too, influenced Catholicism after him. This principle is absolutely correct, and it draws its power from the Gospel message itself: error can only be deprecated, hated, combated by the disciples of him who is the Truth; while the errant person - in his inalienable humanity - is always a living image, however rudimentary, of the incarnate Son of God; and thus he must be respected, loved, and assisted as much as possible. But reflecting on this statement, I cannot forget that the historical wisdom of the Church has never reduced the condemnation of error to a pure and ineffectual abstraction. The Christian people must be put on guard and defended against those who actually sow error, without ceasing to seek out his true well-being, and without judging anyone's subjective responsibility, which is known to God alone. Jesus gave precise instructions to the heads of the Church in this regard: he who causes scandal through his behavior and doctrine, and will not be persuaded by personal admonition or the more solemn rebuke of the Church, "let him be to you as a pagan and a publican (cf. Matthew 18:17); thus foreseeing and prescribing the penalty of excommunication. Pope Roncalli had assigned to the Council, as its task and objective, the "internal renewal of the Church," an expression more pertinent than the word "aggiornamento" ("updating," also one of John XXIII's words), which, however, met with undeserved success. This was certainly not the intention of the supreme pontiff, but "aggiornamento" included the idea that the "holy nation" should seek to conform itself more closely, not to the eternal plan of the Father and his desire for salvation (as it had always believed it should do in its attempts at genuine "reform"), but to the "giornata" ("day"; to temporal, worldly history); and it thus gave the impression of indulging in "chronolatry," to use the expression of disdain coined later by Maritain. John XXIII yearned for a Council that would achieve the renewal of the Church not through condemnations, but using the "medicine of mercy." By abstaining from reproving error, the Council would by this very means avoid formulating definite teachings that would be binding for all. And in fact, it held consistently to this initial direction. The source and synthesis of these tendencies was the declared purpose of aiming to conduct a "pastoral Council." Everyone, both inside and outside of the Vatican hall, expressed satisfaction and contentment with this definition. But in my own little corner at the edge of the proceedings, I felt some difficulties rising up within me, against my will. This concept seemed ambiguous to me, and the emphasis with which "pastoral focus" was attributed to the Council was suspicious: was this, perhaps, intended to imply that the previous Councils did not intend to be "pastoral," or that they had not been pastoral enough? Was there not pastoral relevance in the clear statement that Jesus of Nazareth was God and consubstantial with the Father, as had been defined at Nicea? Was there not pastoral relevance in clarifying the realism of the Eucharistic presence and the sacrificial nature of the Mass, as happened at Trent? Was there not pastoral relevance in presenting the primacy of Peter in all its value and all its implications, as Vatican Council I had taught? It is clear that the declared intention was that of placing special emphasis on the study of the best ways and the most effective means to reach the heart of man, without thereby diminishing positive consideration for the traditional magisterium of the Church. But there was the danger of forgetting that the first and irreplaceable form of "mercy" for wayward humanity is, according to the clear teaching of Revelation, the "mercy of truth"; a mercy that cannot be exercised without the explicit, firm, steadfast condemnation of any distortion or alteration of the "deposit" of faith that must be safeguarded. Some might even have recklessly supposed that the redemption of the children of Adam depended more on our powers of flattery and persuasion than on the soteriological strategy preordained by the Father before all ages, entirely centered on the Paschal event and its proclamation; a proclamation "without persuasive discourses of human wisdom (cf. 1 Corinthians 2:4). In the post-conciliar period, this was not merely a danger. Communism: the Council does not address this. If one attentively scans the comprehensive index [of the Council documents], it is stunning to confront this categorical silence. Communism was, without a doubt, the most imposing, enduring, pervasive historical phenomenon of the twentieth century; and the Council, despite having proposed a Constitution on the Church and the modern world, does not speak of it. Beginning with its triumph in Russia in 1917, after half a century communism had succeeded in causing many tens of millions of deaths, the victims of mass terror and the most inhuman repression; and the Council does not speak of it. Communism (for the first time in the history of human folly) had practically imposed atheism upon the populations subjected to it, as a sort of official philosophy and a paradoxical "religion of the state"; and the Council, although it addresses the case of atheists, does not speak of it. During the same years when the ecumenical council sessions were being held, the communist prisons were still places of unspeakable sufferings and humiliations inflicted upon numerous "witnesses of the faith" (bishops, priests, devoted lay believers in Christ); and the Council does not speak of it. This was different from the supposed silences toward the criminal aberrations of Nazism, for which even some Catholics (including some who were active at the Council) later reproached Pius XII! During those years, although I was aware of the great anomaly of this reservation, especially on the part of an assembly that had discussed almost anything, I was not at all scandalized. On the contrary, I must say that I understood the positive aspects of this approach. And this was not so much because of the imminent possibility of negotiating with the communist regimes for permission for the bishops controlled by them to participate in the Council, but more from anticipation that any sort of official stance, even the most bland and restrained, would have unleashed even harsher persecution, thus making heavier the cross of our persecuted brothers. In essence, everyone shared at least unconsciously the conviction that communism was a phenomenon so entrenched as to have become irreversible: this meant that one had to come to terms with things as they were, for who knows how much longer. Upon closer examination, this was also in essence the justification for Ostpolitik ("the policy of dialogue and of hoped-for understandings with the countries of the East") of the Holy See (of John XXIII and Paul VI); this policy seemed soundly realistic and historically opportune to us. One who never shared this perspective was John Paul II (as I understood from a conversation in 1985). On July 7, 1997, John Paul II kindly invited me to lunch, and extended the invitation also to the master of ceremonies for the archdiocese of Bologna, who accompanied me and thus remains a valuable witness of this episode. At table, the Holy Father said to me at one point: "Did you see that we have changed that statement in 'Tertio millennio adveniente'?" The draft, which had been sent to the cardinals before publication, contained this expression: "The Church acknowledges as her own the sins of her children"; an expression that - as I had stated with respectful frankness - could not be set forward. In the definitive text, the idea had been changed as follows: "The Church always acknowledges as her own her sinful children." At that moment, the pope took care to remind me of this, knowing that it must have pleased me. I replied by expressing my gratitude and manifesting my complete satisfaction with the theological formulation. But I also felt prompted to add a reservation of a pastoral nature: the unheard-of initiative of asking pardon for the errors and inconsistencies of past centuries would, in my view, scandalize the "little ones," those most favored by Jesus (cf. Matthew 11:25): because the faithful, who do not know how to make many theological distinctions, would see these self-accusations as a threat against their serene adhesion to the ecclesial mystery, which (as all the professions of faith tell us) is essentially a mystery of sanctity. And these were the very words of the pope's reply: "Yes, that is true. That will require some thought." Unfortunately, he did not reflect on it sufficiently. The most tiring days for the cardinals are the ones immediately before a conclave. The Sacred College gathers each day from 9:30 a.m. until 1 p.m., in an assembly where each of those present is free to speak his mind. But one intuits that public attention cannot be given to the question closest to the hearts of the electors of the future bishop of Rome: whom should we choose? And so the result is that every cardinal is tempted to cite, more than anything else, his own problems and difficulties: or better, the problems and difficulties of his local church, his country, his continent, the whole world. And without a doubt, there is great value in this general, spontaneous, unvarnished presentation of information and assessments. But also without a doubt, the picture that emerges is not designed to give encouragement. My state of mind and the dominant tone of may reflection emerges from the statement that, after great perplexity, I decided to make on Friday, April 15, 2005. "1. After hearing all of the statements - correct, opportune, impassioned - that have been made here, I would like to express to the future pope (who is listening to me now) my complete solidarity, concord, understanding, and even a bit of my fraternal compassion. But I would also like to suggest to him that he not be too worried about what he has heard here, and that he not be too frightened. The Lord Jesus will not ask him to resolve all the world's problems. He will ask him to love him with extraordinary love: 'Do you love me more than these?' (cf. John 21:15). A number of years ago, I came across a phrase in the 'Mafalda' comic strip from Argentina that has often come back into my mind in these days: 'I've got it,' said that feisty and perceptive little girl, 'the world is full of problemologists, but short on solutionologists'." "2. I would like to tell the future pope to pay attention to all problems. But first and most of all, he should take into account the state of confusion, disorientation, and aimlessness that afflicts the people of God in these years, and above all the 'little ones'." "3. A few days ago, I saw on television an elderly, devout religious sister who responded to the interviewer this way: 'This pope, who has died, was great above all because he taught us that all religions are equal'. I don't know whether John Paul II would have been very pleased by this sort of elegy." "4. Finally, I would like to point out to the new pope the incredible phenomenon of 'Dominus Iesus': a document explicitly endorsed and publicly approved by John Paul II; a document for which I am pleased to express my vibrant gratitude to Cardinal Ratzinger. That Jesus is the only necessary Savior of all is a truth that for over twenty centuries - beginning with Peter's discourse after Pentecost - it was never felt necessity to restate. This truth is, so to speak, the minimum threshold of the faith; it is the primordial certitude, it is among believers the simple and most essential fact. In two thousand years this has never been brought into doubt, not even during the crisis of Arianism, and not even during the upheaval of the Protestant Reformation. The fact of needing to issue a reminder of this in our time tells us the extent of the gravity of the current situation. And yet this document, which recalls the most basic, most simple, most essential certitude, has been called into question. It has been contested at all levels: at all levels of pastoral action, of theological instruction, of the hierarchy." Let's hope this book isn't translated into English - we've got enough problems already.